“The Haunting of Hill House” is a spectacular, yet long, series. It is your run-of-the-mill haunted ghost story, but it also involves our main characters’ ghosts of the past. The Netflix series is directed by Mike Flanagan, introducing to the viewers 10 roughly one-hour long episodes. Throughout the series we see the future and the present, sometimes going back and forth between both. It can be a bit confusing when you just start watching, as I really didn’t know what was going on at first. But as the episode went on it started to make a lot more sense. I’ll preface this by saying I hate scary movies. 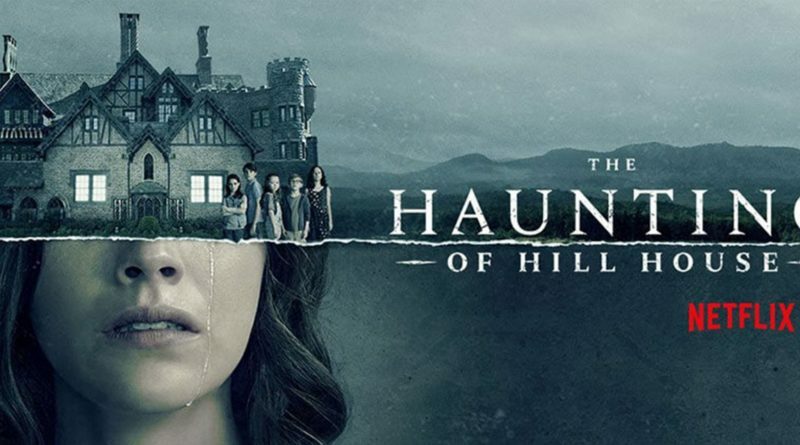 When I was 10-years-old, I couldn’t even watch “Jurassic Park.” And although “The Haunting of Hill House” starts off seeming to be another horror film that I’d have to hide under the covers from, it easily became one of my favorite shows of all time. First of all, the characters – and their respective actors – are so human it hurts. They each deal with their own difficulties in the world and with the reminiscent hauntings of the house. Nell, the youngest and one of the twins, sees the Bent-Neck Lady throughout her life, causing a traumatic upbringing and a kind of sleep paralysis that continues on into her adulthood. Luke, the other twin, is haunted by the Floating Man which causes him to become an addict later in life to escape the images of the Floating Man which makes the rest of the family distant from him. Theo is “sensitive” to people when she touches them, so she wears gloves and long-sleeved shirts to combat this. In my opinion, Theo is the best character of this show by far as she can see and feel pain when she touches a body, and she’s just so real. Watch the show and you’ll see what I mean. Steven, the oldest, uses his families stories (he was not there to see the horrors that everyone else saw) to make his famous novel, causing a rift between him and the family. Shirley is the second-born of the family and has to have control of everything in her life. Throughout the series, we see each of the children come to terms with themselves and their personalities and faults. While I wish I could tell you the specifics, I don’t want to spoil you. Their mother begins to become influenced by the house, causing her to want to kill the twins (Luke and Nell) in order to preserve their youth and innocence in the house. The best part about this show is that you already know what has happened due to the time skips in episodes and between episodes, but you still want to know the why and how it happened. While I say in the beginning that this is technically a horror movie, it is more of a story of a family learning to combat their own ghosts mostly, but I guess combating regular ghosts a little too. But I do recommend preparing yourself for a few episodes, as the jump-scares can really scare your socks off as they did mine. All-in-all, if you have 10 hours or more to spend watching a show, I truly recommend binge watching this show. You won’t regret it.